If you can't love yourself how in the hell are you gonna ... *falls into abyss*. It doesn’t take much to get this fandom’s racist engines started. Despite being an inclusive show that touts some of the most gender- and racially diverse casts of all time, RuPaul’s Drag Race’s fandom has an unsavory side. While the vast majority of the show’s fans watch to celebrate its queens, a very vocal cadre of Drag Race fans spend their time harassing the show’s queens, either for their race, their gender identity, or simply because of the drama of the show. It’s gotten to the point where even the queens know the fandom has a problem and have spoken out against it. Aquaria felt the need to speak up about the toxic fandom after the recent season 11 reveal and All Stars 4 has seen fans attack all the Black queens, but especially Latrice Royale. After the All Stars 3 finale, BenDeLaCreme released a statement wrist-slapping “fans” who bullied other queens on social media. Season 2 winner Tyra Sanchez has called the Drag Race fans “psychotic” while drawing attention to the difference in treatment for white and Black queens. 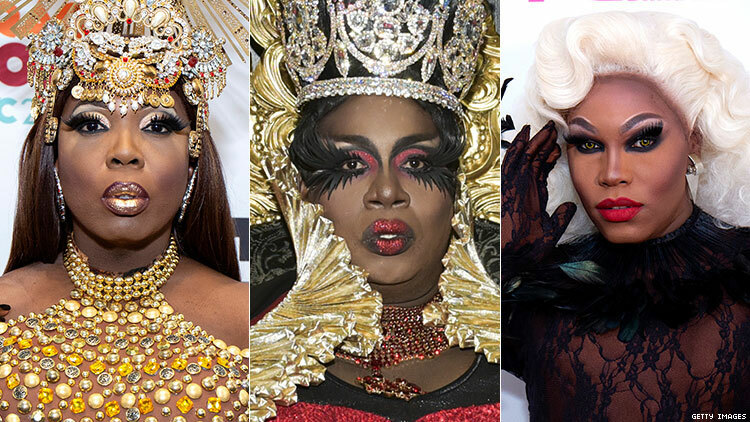 Despite being in a cast chock-full of talented queens of color, Asia O’Hara was the sole Black queens to advance to the final four of Drag Race’s 10th season. A few days before the finale, O’Hara posted a note to her Twitter sharing that racist Drag Race fans had threatened to burn her alive because she is Black. The note also recalled a similar instance from Asia’s past when bullies threatened her because she was Black and queer. You are one of the most talented and compassionate queens ever, Asia. your stength and vision will get you through any hurt. These racist fans, meanwhile, don’t deserve drag and we are going to shut them OUT. But simply bullying season nine queens was not enough for Valentina’s fans. Latrice Royale, who eliminated Valentina during her All Stars 4 run, became their next target. The racist hate became so intense that Valentina stepped in and commented on her fellow queen’s Instagram. While immensely popular among fans who can’t wait to see her in season 11, Silky Nutmeg Ganache is already dealing with fatphobia from some of the queens. Much of the queen’s brand revolves around body positivity, but it turns out fans will be terrible no matter what message Ganache is trying to spread. Several queens of size have spoken about fatphobia in the fandom, as well. Season six queen Darienne Lake called out the fandom for undervaluing the show’s queens of size in a follow up post to Bob the Drag Queen pointing out that Black queens routinely have fewer Instagram followers than white ones. Being the show’s OG winner doesn’t stop the racist threats, either. When Bebe Zahara Benet returned for a shot at a second crown in All Stars 3, she was confronted with just how racist the show’s fandom has grown since her win in 2009. After she won the soup can/ disco challenge and defeated BenDeLaCreme in the Lip Sync for Your Legacy, Benet sent home season nine queen (and All Stars 3 fan favorite) Aja, prompting fans to spew vile, racist filth to her on Instagram. While the (spoiler alert!) recent elimination of Manila Luzon brought a lot of tears to Drag Race fans, it also brought at least one racist meme into the ether. Shortly after Manila’s elimination, one fan who realized that the remaining roster of queens included one white queen and four Black queens, they created a meme that saw the four Black queens’ heads photoshopped onto ultramuscular bodies, looking over Trinity the Tuck, who was photoshopped onto the body of a petite white woman. Monet shared the meme on Twitter. “I saw this picture, and it didn’t make me feel good. Am I being ridiculous? What do you think?” she wrote. Several people in the replies added that her queasy feeling wasn’t just her: the racist meme was indeed nauseating. Season 11 of Drag Race will see the workroom welcome its very first Muslim queen, Mercedes Iman Diamond. And while there is one fellow queen who has done an Islamophobic performance in the past, she’s not the biggest problem. During the livestream that announced the queens, several fans noticed that people were harassing Diamond with Islamophobic comments, which prompted the infamous Drag Race subreddit to have a conversation about what they are *not* going to do today. That reveal was very telling. One, that the *fans* of this show are extremely racist (among many other means of heinously judgmental) and also that someone at vh1 HATES my guts and wants me to show up to the s11 finale without an ounce of dignity left in my body. All Stars 4 also saw underdog Naomi Smalls catch heat for eliminating frontrunner Manila Luzon. After the shocking lipstick pull, Smalls received some heat online for her decision to send Luzon packing, prompting Aja to once again take the fandom to task for their racist attitude. “Just a reminder that @manilaluzon is a legend and a class act and would never endorse sending hate to @naomismallsduh so feel what u feel but no racism, no disgusting death threats, etc are okay,” she wrote. Just a reminder that @manilaluzon is a legend and a class act and would never endorse sending hate to @naomismallsduh so feel what u feel but no racism, no disgusting death threats, etc are okay. Related | Did Judy Garland's Death Actually Fuel the Stonewall Riots?